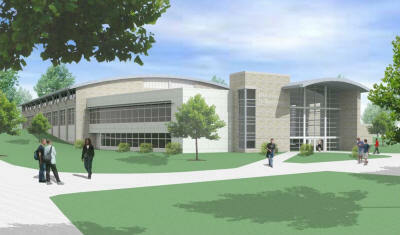 April 4, 2008 -- Arkansas State University is set to begin construction on the Student Recreation and Wellness Center. The groundbreaking ceremony for the $18 million building was held today at 11 a.m. The construction site is located on Aggie Road, west of Arkansas Hall. Participants in the ceremony included Dr. Robert L. Potts, Chancellor, ASU-Jonesboro, Dr. Rick Stripling, vice chancellor, Student Affairs, Student Government Association president Morgan Pippin, Mike Gibson, Chair of the ASU Board of Trustees, and Tiffny Frazier, former president of ASU’s Student Government Association, who led the initial effort to get approval for the center. The Student Recreation and Wellness Center is designed as a 74,000-square-foot structure that will house multiple amenities for students. The fitness club that is currently located in the Student Union will be moved to the Student Recreation and Wellness Center. The Student Recreation and Wellness Center will also house all indoor intramural sports programs currently conducted in the Health, Physical Education, and Sports Sciences building (HPESS). Participation in intramural sports programs has almost doubled at ASU since the fall semester of 2004. Almost 10 per cent of students participated in intramural sports programs as of fall semester, 2004, and in spring semester, 2008, that figure has risen to between 18-20 per cent. This new recreation facility will have two levels and will be equipped to outfit an aquatics center in the future. The lower level will house approximately 17,000 square feet of cardiovascular and strength training equipment, three basketball/volleyball courts, one multipurpose activity court, office space, locker rooms, and wellness assessment rooms. The upper level will house a three-lane walking/running track, as well as meeting rooms and exercise classroom space. The Student Recreation and Wellness Center will be able to increase the number of fitness classes currently offered, as well as adding additional wellness and nutritional programming options. The construction of the Student Recreation and Wellness Center will give the Arkansas State University campus approximately 60,000 additional square feet of recreation space than is currently available. All ASU-Jonesboro students will be able to use the facility by presenting a valid ASU ID. Faculty and staff members will be welcome to purchase memberships to the facility, and those memberships will allow them access to all areas and programs that are offered. Construction will begin on the facility this summer and is expected to be completed by the beginning of the spring 2010 semester. Hastings & Chivetta Architects from St. Louis, Mo., as well as the Jonesboro firm of Brackett-Krennerich and Associates, are the facility’s architects. CDI Contractors of Little Rock is general contractor for the project.